Introducing the D-Fuse Softbox Grid! 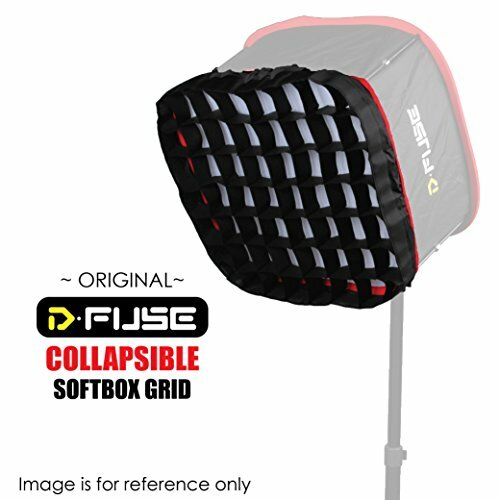 The D-Fuse Grid is the first compact collapsible softbox that can be attached to the D-Fuse Collapsible Softbox to help control light spillage. The D-Fuse Grid as a lightweight accessory to enhance the D-Fuse Softbox line without adding bulk to your heavy camera gear. The D-Fuse Grid can be easily carried in your backpack as it folds into a small bundle about the size of your hand. Installation of D-Fuse Softbox Grid onto the D-Fuse Softbox is easy! Simply unfold the D-Fuse Softbox Grid and expand the grid to its full length. Secure the grid over your softbox and you've finished your installation! Package Contents include 1x D-Fuse Grid. COMPACT & FOLDABLE SOFTBOX GRID: The D-Fuse Softbox Grid is a compact and foldable softbox grid that can be attached to the D-Fuse Softbox to help control light spillage. SIMPLE TO FOLD & CARRY: The softbox grid can be folded up into a small, portable bundle which can be placed in your bag for easy storage. LIGHTWEIGHT AND DURABLE: This ultra portable grid is so light, you will barely be able to notice its weight when you carry it around. QUICK INSTALLATION: Simply unfold the D-Fuse Softbox Grid and expand the grid to its full length. Secure the grid over your softbox and you've finished your installation! PERFECT FIT: The D-Fuse Grid is easy to install and is tailored to perfectly fit your D-Fuse Softbox. If you have any questions about this product by Kamerar, contact us by completing and submitting the form below. If you are looking for a specif part number, please include it with your message.